I was just over at Cosmo’s blog reading some back posts, and she mentioned she’ d moved and not unpacked some boxes of clothes for months. She was wondering, if she hadn’t missed the clothes, should she just chuck it all out? Does it fulfill a need that makes other items I love in my wardrobe work? If you can’t answer yes to two of these 3 questions, let it go, it’s not earning it’s place in your wardrobe. 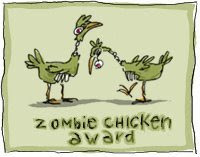 Also, I received the Zombie Chicken award from Sallymandy of the Blue Kimono – a fabulous blog I love to read. I am passing it onto La Belette Rouge who has me staying up late to read each post, when really I should be asleep! Aww Thanks for reading my blog. I had a feeling that that is the advice I would get. I just am pretty sure that if I use that criteria to cull my wardrobe, I’ll end up with 3 dresses that I can wear and 3 tops that don’t go with the 1 pair of pants or 3 skirts. That is a terrifying concept to me. Imogen, I agree with your 3 simple questions. I also add to them the question of: When was the last time I wore it? If it sat around for the 2 seasons not being worn, out it goes. Cosmo – you’ve got some great stuff there! Scary as it is -if you’re not wearing it, there is no point in keeping it! Sher – thanks – yes – true – but also, sometimes we keep things too long even though we are wearing them! Anne – I will look around for you for the sweater dresses. Also, the only place I’ve seen waistcoats that are a bit longer was actually in Target. I am going to apply these three questions to my wardrobe when I get set to move next month. It is all part if the new me plan. Happy Easter Dear!! Those are such great questions. There are a few things I’ve hung on to for years thinking I’ll one day have that thing that works with it. Mostly though, I’m quick to give stuff I don’t wear anymore to my sisters who are happy to have them! – Is it in very good condition (or can it be restored to that condition at reasonable cost)? – Is it ‘who I am now’? To chuck or not to chuck , that is the question! I have thown things away and then wished I hadn’t ! Imogen a while ago you wrote a post advising people to write down a list of words that described how they’d like others to see them. I thought this was genius -and wrote my list in my Moleskine. Then I used the list to ‘weed’ my wardrobe – and I’m really happy with the results! Anne – Ben Sherman has some very cute knit waistcoats this season. Cable knit,with lil’ pockets – and they’re about hip length. As soon as my experiment is over I am looking forward to going through my wardrobe with these rules in mind. Great encouragement! I have lots of chucking to do! SWC – moving is a great opportunity to clear out your wardrobe! 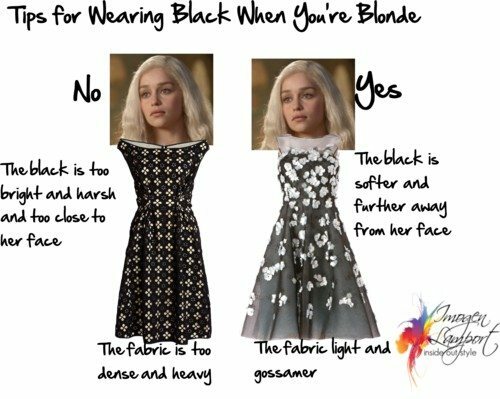 Maria – there is usually good reason why you don’t wear an item – not your colour, not your style, not flattering, wrong fabric etc. It never will be right, so just let it go! Duchesse – very true – if it’s threadbare, no matter how much you love it, it needs to be replaced. Lady Jicky – if unsure, move to another wardrobe, if you haven’t gone after it for a year, then let it go! Jamtart – that’s such great feedback- the more you understand yourself and style preferences, the easier it is to know if something is right or wrong for you. Thanks also for the tip on Ben Sherman vests. Jane – I’m sure that you already know what you don’t love wearing and are keen to get rid of! Kelee – too much clutter, clutters our minds as well as our wardrobes! Great questions! Do I LOVE it is a question that has stopped a lot of unnecessary purchases. This is a really helpful list. I’m going to use this when I buy things, too–especially op shopping, when a “deal” can overshadow a piece’s problems. Your 3 simple questions get right to the heart of the issue. Thanks. Belette – I can think of no better blogger who keeps me glued to the screen zombie like way past my bedtime (so I can be first to comment!). Sallymandy – whether it’s $1 or $1000 we should ask ourselves these questions. Maybe the economy would be in better shape if we had! Angela – these are useful questions you can ask your client to figure out. thnaks for introducing me to a new blog- great!